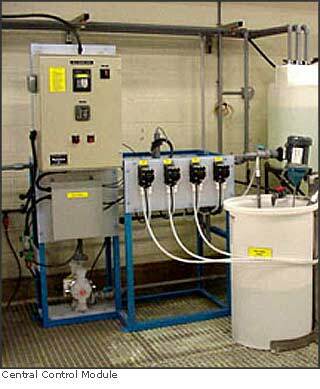 The AqualogicTM Automatic Batch Treatment System is a compact, automatic treatment system designed to batch treat 500-2000 gallons of industrial wastewater. 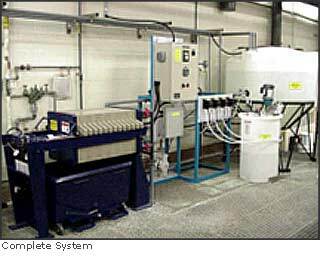 Depending upon the reagent chemistry added and instrumentation provided, the equipment will treat mixed rinsewaters and process dumps for cyanide oxidation, chrome reduction, precipitation of heavy metals, solid dewatering, and removal of oils and greases, producing an effluent suitable for discharge to local sewers, according to permit regulations. The control panel houses an imbedded PLC programmed to sequence all process steps. A 5.7 touchscreen is mounted on the door for process inputs and process monitoring. The System is constructed of three modules to allow versatility in function and to provide flexibility in locating the system. The central control module, the filtration module, and the reaction module are connected only with PVC pipe allowing maximum use of available space. Components need not be located next to each other for proper functioning. The PLC control panel, metering pumps, batch mixing & transfer pump, injection ports, transfer piping, and automatic valves are mounted on a steel, epoxy painted base to form a compact integrated module requiring minimal installation effort. Probes for pH and/or ORP are mounted in line to keep the sensing elements wet during idle periods and allow processing of partial batches. The batch treatment process is initiated by activating the start button on the panel. The reaction vessel is a cone bottomed closed head polyethylene tank on an epoxy coated steel frame. Effluent is pumped from the cone bottom to the control module for chemical additions and monitoring. Eductors on the return line in the tank wall accomplish the mixing of the effluent. Upon completion of the treatment cycle the pump will deactivate for the programmed settling time to allow the precipitated solids to settle. Upon completion of settling, the air actuated valves will automatically divert the settled solids to the filter press for dewatering. The treated effluent will be discharged to the sewer. Larger Reaction Vessel; 1000, 1500, or 2000 gallons.